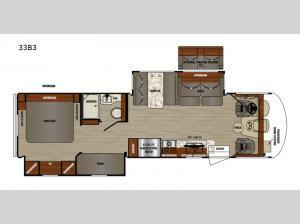 This Georgetown 3 Series class A gas 33B3 motorhome is sure to be a crowd pleaser with your small to medium-sized family or group of friends! Your kiddos are sure to love having their own bunk beds which are conveniently located right across from the full bath. Your meal prep will be a breeze in this kitchen, and with the large pantry and the 12 cu. ft. gas/electric refrigerator you can bring along all of your favorite foods. While you're whipping up your best meal with either the three-burner cooktop, the oven, or even the microwave, you can socialize with the rest of your group while they comfortably sit at either the booth dinette or the sofa. You can even have your favorite movie playing on the 40" LED TV. When you're ready to hit the sack, head to the rear private bedroom and enjoy a good night's rest on the king bed with nightstands on either side. Inside the bedroom, there are also two wardrobes and a 32" LED TV for those nights when you just can't fall asleep! 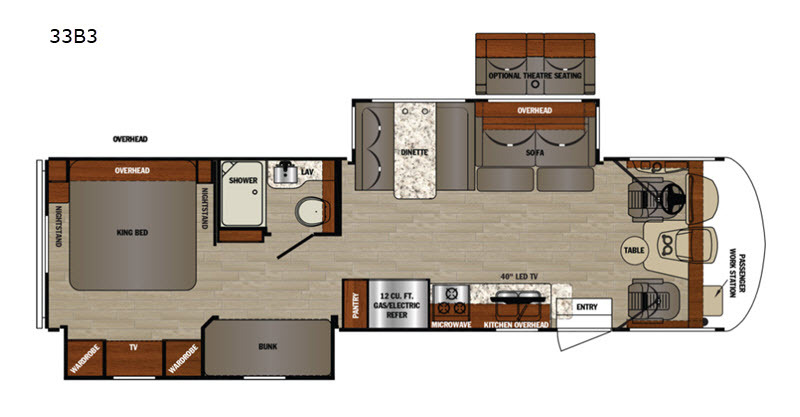 It is easy to make plenty of memories with your family when you choose any one of these Georgetown 3 Series GT3 class A gas motorhomes by Forest River. A few luxury features include the "SUPER STORAGE" rear cargo compartment, the stainless steel bathroom sink, the 32" LED TV in the bedroom, plus the outside shower. In the cab there is a custom dash with ABS side consoles, drink holders, a 110V outlet/USB, as well as manual cockpit side sun shades. With the Shaw residential vinyl flooring, you won't have to worry as much when spills occur either. There are three interior colors to choose from, and along the exterior there is a Champagne-colored gel coat, plus a one-piece fiberglass roof to give you a motorhome that will last through your adventures.